Takahashi FSQ-106ED @ f/5.0 (530 mm F.L.) Captured at 2.1 arcsec/pixel. Shown at 3.88 and 9.32 arcsec/pixel. SBIG STF-8300M Self Guiding Package w/ mono ST-i, using an AstroDon 5nm Ha and Baader RGB filters. 8/6/2015 to 9/17/2015 Chino Valley, AZ... with CCD Commander & CCDSoft. A standard image-train calibration was used for star color, as determined by eXcalibrator v4.30, and then adjusted for altitude extinction. My best guess for the nebula color in the mouse-over view. CCDStack to calibrate, register, normalize, data reject and mean combine the RGB sub exposures and creating the RGB image. PixInsight processing includes gradient repair, non-linear stretching with HistogramTransformation and HDRMultiscaleTransform. PhotoShop for creating the Ha:RGB image and adding the 30% RGB. Click here for the Ha image. Sharpless 115 stands just north and west of Deneb, the alpha star of the constellation Cygnus, the Swan. Noted in the 1959 catalog by astronomer Stewart Sharpless (as Sh2-115) the emission nebula lies along the edge of one of the outer Milky Way's giant molecular clouds, about 7,500 light-years away. 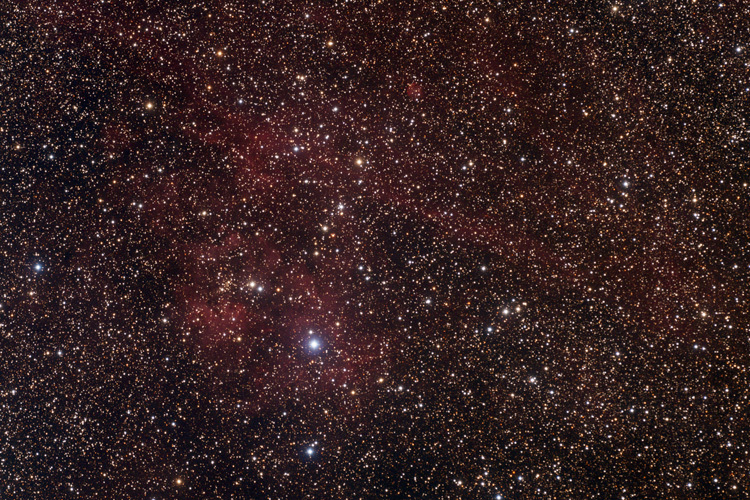 Hot stars in star cluster Berkeley 90 power the nebular glow. The cluster stars are likely only 100 million years old or so and are still embedded in Sharpless 115. The small bight object, near the top, is Abell 71. The nebula is also cataloged as PK 085+04.1, PN G084.9+04.4 and Sh 2-116. Initially cataloged as a planetary nebula, the object is now recognized as an HII region.